When it comes to beef, there is nothing better than a dry-aged steak. No other type of steak compares with the tenderness and the exploding beefy taste that a perfectly dry aged steak provides. It is disappointing to see that such a renowned craft is dying. There was a time when dry-aged beef was widely accessible to just about anyone due to it being sold in most butcher shops in America. But times have changed and less expensive methods, like wet aging, have caused the market to deter attention from dry age beef. Though it is a declining art, dry aging is still recognized as a delicacy throughout the United States. Dry age beef is so special because it has such amazing and unique flavor. Also, the complicated and costly process makes harder to find. The experience of biting into a dry aged steak is almost indescribable. 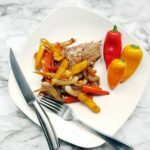 The buttery texture allows your teeth to sink smoothly into the beef and your mouth is immediately flooded with an intense beefy roasted flavor. As you finish your bite of this temptingly tasty dry aged beef, your taste buds are left in awe and a feeling of complete desire is felt for another. The taste of dry aged beef is second to none and beef that is not aged lacks the explosive concentrated flavor that dry age offers. The taste is so extraordinary that the only way to experience it is to try it. Dry aged beef is a luxury we all deserve to enjoy. It will provide you with an experience and taste you will never forget. 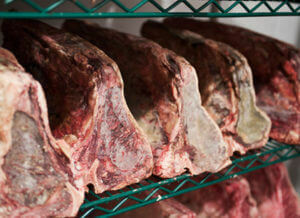 Dry age beef is expensive because it is such a highly valued product and goes through a complex process to be created. Because of its limited amount of suppliers, it is a bit harder to find but that problem can be solved due to online mail order options that provide endless variety with fast shipping that comes with dry ice and a cooler. 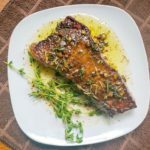 Though it is available online, in high end steak houses and grocery stores many steak fanatics take it upon themselves to age the beef at home because they are such fans of it.